Folk music, dancing wooden puppets, miniatures and intriguing sculptures. Smell of freshly cured leather drifts through the air awakening all our senses and we discover the thousand and one facets of its craft as we walk through the Jodhpur Fort, in the deserts of western Rajasthan. While the Rajputs spent most of their time in wars, trying to protect their territories, they were also great patrons of art and craft, creating a tradition which is rich and diverse. And what better place to learn about regional crafts than one of the biggest residences of the Rajputs, Mehrangarh as the Jodhpur fort is called. Situated on top of a hill, it overlooks the town and offers a particularly panoramic view of the region; from above we can understand why Jodhpur is called the blue city. The exact reason of why the town was painted blue is still unknown, some say it is to keep away mosquitoes and termites; or associate it with a community of Brahmin, the Hindu priests, while others say that it was simply a fashion which has now enveloped the entire city. Well, whatever may the reason be, the view from Mehrangarh is great and the photos refreshing. A UNESCO world heritage site, Mehrangarh also houses a museum. The fort is pretty well organised and equipped to welcome tourists with electronic and audio guides, brochures and a well detailed map. Inside you will also find a cafeteria as well as craft shops. Walking through the fort you come across different forms of art, through some fine and exotic displays. Even before you are inside the fort, waves of music start filtering through the air to the ears. As you follow the sound, you come across two musicians, sitting on the ground in a shaded corner of the fort, wearing large, colourful Rajasthani turbans, with their fingers moving in a masterly fashion over sarangi, a local favourite of the musicians. The setting is perfect as the intoxicating music transports us back several centuries in time, when Mehrangarh was at its peak! All over Rajasthan, the folk and devotional music is largely practiced by nomadic musicians. “At Jodhpur, it is the Langas, originally nomads who settled in the city to practice the trade in camels and spices,” says Vijay, a local chatterbox who must be used to foreign tourists as he even speaks French. Their music is a combination of classical and popular repertoire. Among the main musical instruments are sarangi (a fiddle), satara (double flute wood), murali (flute), dholak (a small drum), moorchang (metal guitar) and dhol (a bigger drum). “The songs vary according to the regions of Rajasthan and they mainly narrate the stories of Gods and former rulers. 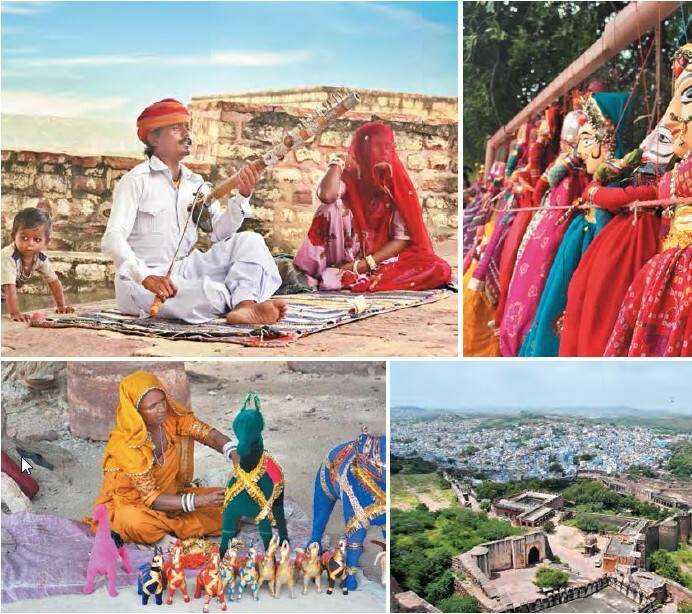 With the objective to promote the Rajasthani folk music across the world, the state government has launched an International Festival of Folk Music in Jodhpur,” says Vijay. Musicians from all over the state come and play here, along with other folk musicians from around the world. 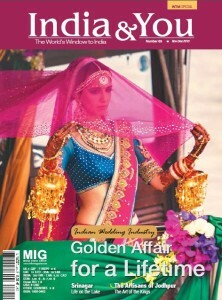 The festival takes place in the gardens of the Mehrangarh Fort. A fortuitous choice as it was in the same gardens that the local musicians had their golden age as the former rulers used to organise similar music festivals, inviting musicians from all over the country. We continue on our path. Under a tree, a woman in her 40s sits, softly singing while arranging her wooden puppets. Her multicoloured sari drags on the sandy ground. She greets us with a broad smile, with her face, wrinkled and tanned by the sun. “We have been manufacturing these wooden puppets for generations, and that too traditionally. Their preparation can sometimes take several weeks depending on the quality of selected materials, “she says, handing us a puppet operated by two threads. This theatrical form of using wooden puppets is called Kathputili. “Kath” means wood and “putli” a doll. Some Indian historians put the origin of this art to the 5th century BC. The shows of Kathputili dramatised the lives of kings and other heroes of Hindu mythology. As recently as a couple of decades ago, in the very remote areas of India, where television had not yet penetrated, Kathputilis represented a very popular entertainment, often used to highlight the social and cultural issues. The woman with the puppets takes two, one in each hand, and operates the threads as if under a spell. While for the tourists the puppets may present an impressive show, in India it is facing a massive challenge for survival in face of other entertainment modes notably cinema, television and the internet. “This art was once an entertainment for the Royals, however, now we have hardly any audience. Moreover with the development of mass tourism, the industry has supplanted crafts and mass manufactured and cheaper puppets have flooded the market. It is now difficult to convince tourists of the quality of our hand-made puppets,” complains the artist. To make the puppets, the artists use teak brought in from other states. The art of wood carving is also found in the doors, windows or balconies. There are also encrusted sandalwood, rosewood and ivory to create valuable interior doors. The sculptors also make peedhas (low seats), beds’ legs or chests. 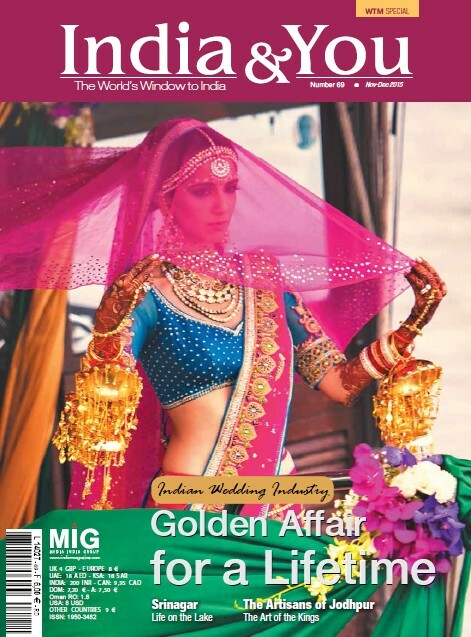 Read the full version of this article and our dossier on the Indian wedding Industry in India & You – November-December 2015 (WTM London special issue).